More information coming soon: join the community to receive updates. Cryptocurrencies, such as Bitcoin, are restricted to their own blockchain technology. They cannot move from one ledger to the next and keep their value and characteristics. To move one digital asset residing on one blockchain to the next is costly and time consuming, if possible at all. Deluge Network’s mission is to solve this problem by providing a platform for integrated financial interactions across the blockchain ecosystem. It simplifies the transfer of digital assets, removing mediating silos, and allowing investors to more easily and directly diversify their portfolio. 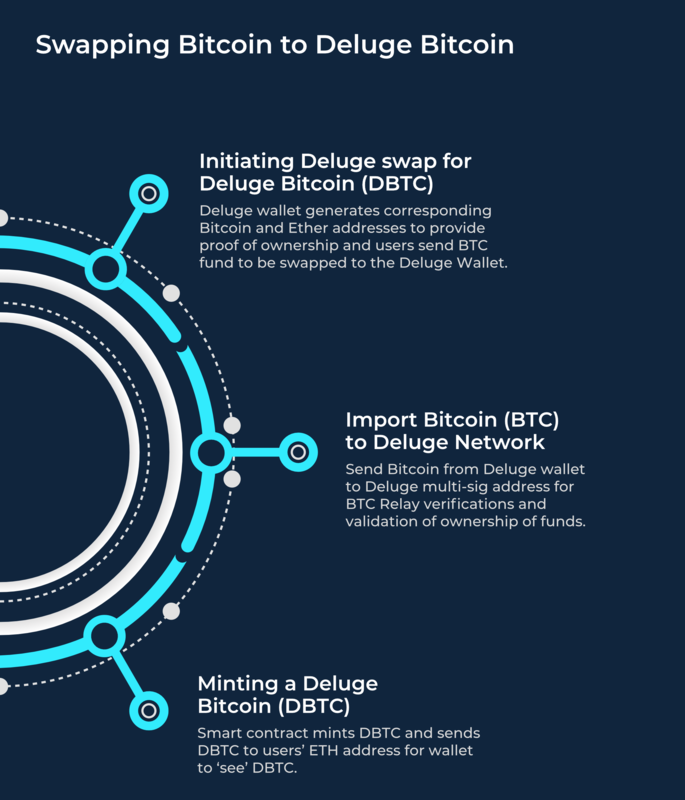 Deluge Network enables the transfer of cryptocurrencies from one blockchain to another, also known as a cross-chain transfer network. Currently, it focuses on transferring assets from Bitcoin to Ethereum, with the mission of applying this learning to connect other blockchains in the future. Deluge Network is doing this by backing Bitcoin with an ERC20 token, DBTC (Deluge Bitcoin), ensuring a 1:1 amount. For this transaction to happen, Deluge will charge a 0.7% transaction fee. 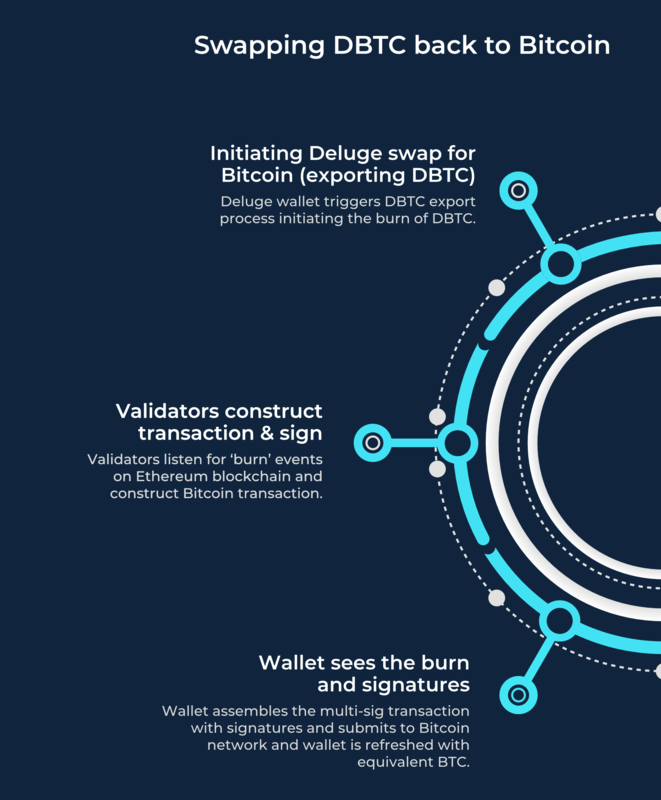 Deluge provides the connection between two existing blockchain to start: Bitcoin and Ethereum, by tokenizing Bitcoin assets on Ethereum blockchain. With Deluge Network’s Bitcoin token (DBTC), an ERC20 token, transacting on Ethereum is now more accessible. DBTC is a Bitcoin backed asset - always mirroring the amount and value of Bitcoin regardless of exchange rates. Our aim is to provide the simplest assets transfer solution to our users. We believe collaboration is the key to provide seamless user experiences and drive cryptocurrency adoption. We would be excited to hear from you and work together to drive an integrated transaction process across chains. Want the latest news about Deluge Network? Subscribe to our mailing list. Deluge Network will not hold an ICO, as DBTC will be minted on demand. New Alchemy provides technology, token game theory, and advisory to the world's most innovative companies. Additional validators to be announced. We invite the community to join us on this journey. © 2017 Deluge Network. All rights reserved.